This comfy youth pajama set bundle is perfect for matching family photos, holiday parties, special events and so much more. Customize the t-shirt with your very own design or even upload a favorite photo to create something unique and one of a kind. Shirt and pajama bottoms will both come in the size selected. Currently, there is no way to order two different sizes in a set. NOTE: Not intended for sleepwear. Though this item is 100% cotton, it does not have flame retardant qualities. Therefore, it does not comply with CPSC's children's sleepwear requirements. 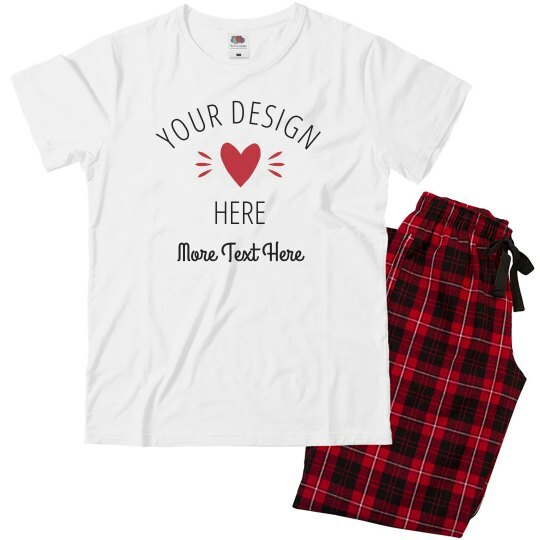 Make your teen's Valentine's Day unforgettable by matching personalized designs of this hearty pajamas with the whole bunch! Add their names and any photo that will best describe their personalities. What an exciting way to celebrate love!